Just a week after fring brought world’s first video calls over IP to mobile, the company announced “the first ever” mobile video calls over internet for the iPhone. fring video enables users to conduct video calls with other users as well as with Skype contacts over their device’s Wi-Fi or 3G internet connection, with support for mobile-to-mobile and mobile-to-desktop calls. The company says this is the first video over internet service on the iPhone or iPod touch. 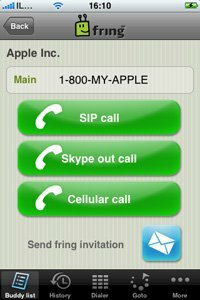 The new fring version with video calls support is currently available to users with iPhone/ iPod touch OS 3.0 and selected Nokia Symbian S60 devices (Nokia X6, N97 mini, N97, 5800, N95 8G and N95). For the iPhone only incoming video-stream is available (due to the location of the camera). 2-way video streaming is available for Symbian devices. “We were the first to bring mobile voice over internet to mobile devices, the first to bring iPhone/ iPod touch users the choice to make free Internet calls, the first to enable cost-saving mobile twitter over internet, and now we’re proud to continue leading the field of rich mobile-internet communication by bringing users the world’s first fring video calls over internet for the iPhone and iPod touch,” said Avi Shechter, Co-Founder & CEO of fring. “As the mobile VoIP trail-blazers since this industry’s inception, we have a responsibility to continue breaking the mobile-internet barriers, and bringing users all the choices, richness and always-on connectivity that internet communications on mobile can deliver,” he added. The new video feature is embedded within the popular fring application that enables free voice calls to other fring, Skype and GTalk users as well as friends on regular phone lines via Skype-Out and SIP services.